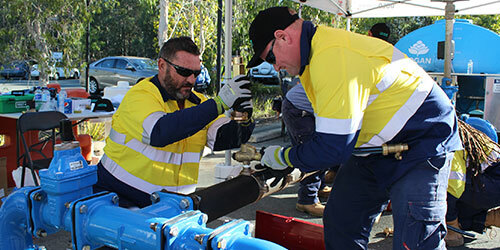 Following the successful Queensland and Victorian Live Mains Tapping competitions held at the WIOA conferences in 2017, we are thrilled to announce the first WIOA NSW Mains Tapping Competition will be held at this year’s NSW conference in Tamworth. The winning team will get their names on an impressive perpetual trophy and the opportunity to nominate a local charity to receive a $1,000 donation. Each team prior to the start of the timed competition a safe work method statement is to be completed by each team and reviewed by the judge. Each team is supplied with the necessary tools and fittings to complete a 20mm water tapping on a 100mm DICL pipe, including a length of water service and stop valve. The teams will carry out an under pressure tapping through a TPFNR and connect length of poly pipe and a ball valve. It is up to the team members to check all tools and fittings are working prior to competition. Equipment failure is deemed the fault of competitors. A starting whistle will sound and the competitors may start the process of tapping the water main. The time keepers will time the competitors using stop watches (one for each team). The 2 man team install the tapping band and ferrule on the 100mm pipe, tap the water main, install 1 metre of poly pipe and install a ball valve on the end of the poly. When completed the ball vale is turned off. When a team has finished they must turn water off at ball valve and return all tools to the tool box shut the lid and hold up their hand, the time will be stopped. When the tapping is complete and inspected the winning time will be recorded, the fastest time recorded on the day will be announced the competition winner. The tapping will be on a pressurised section of 100mm DICL pipe, set up on a stand, and pressurised from a water tank or supply. Tapping must be completed without electrical or pneumatic tools or devices. 1 X 20mm ball valve.